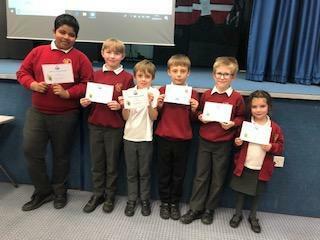 Today, one child from each year group formed the 'St Lawrence Legends' Team and took part in the annual Amery Hill Spelling Bee. Daisy, Alex, Zathy, Nathaniel, Luke and Tawhid worked together brilliantly and strategically. They also won the interval game where you had to make as many words as you could out of a given word. They managed 32! We were very proud of how they did.